Turn your grilling space into an outdoor living and entertaining room. Whether you are having a few friends over for a weekend barbecue or taking a staycation around the pool, the right lighting can make all the difference between simply cooking out and feeling like you are relaxing resort style. For example, turn your deck or patio into an outside living room by adding task lighting and accent lighting. Perhaps install a pendant or chandelier overhead and sconces close to tables and chairs. For additional ambiance, add lighting near plants, in trees and as edging around the pool. Provide task lighting in the grill area, but choose a fixture with a metal shade, to avoid adding too much glare. 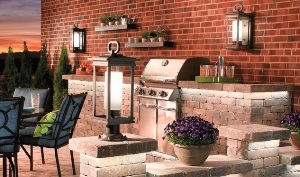 See the latest outdoor lighting products at Hortons Home Lighting. Add lights around steps, walkways and doors. Consider an automated control system that turns on lights with a timer, and allows the light levels to be adjusted from both inside and outside. Add uplights to create a drama factor in your garden. Good places are against unique plants or in interesting trees. When possible, incorporate solar-powered fixtures. Find ideas for lighting your home in the 2014 issue of Lighting magazine. The magazine features design tips and pictures of the newest and most innovative fixtures on the market. Just stop by your local Hortons Home Lighting store for more information about specific products pictured in the magazine. Pick up your free copy of Lighting magazine at a Hortons Home Lighting store.